Today I’m sharing the ultimate in bright and cheery holiday cakes. It’s a little tart, it’s a little sweet, and it has a truly to die for texture, getting better and better as it sits. (Truly- I just finished a slice on day 4 that rivaled day 1’s slice!) 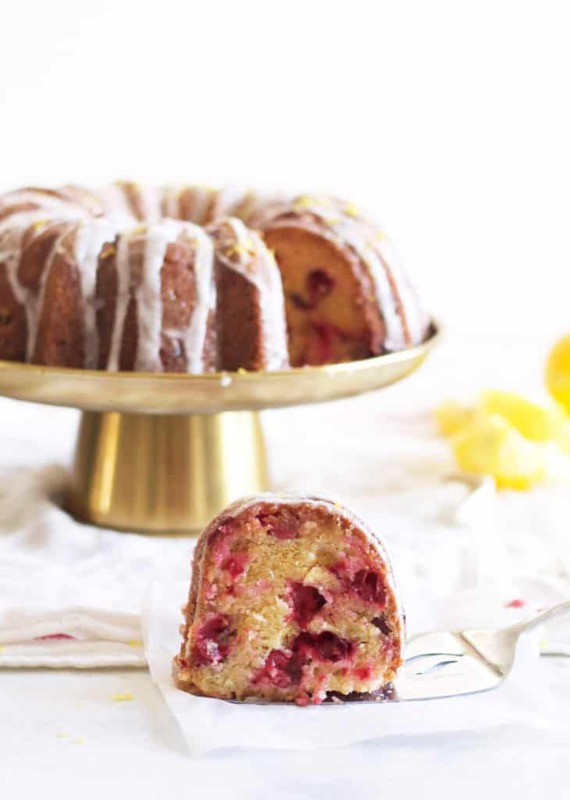 I needed to use up a leftover bag of Thanksgiving cranberries, and had picked up the most perfectly yellow meyer lemons that added the most wonderful flavor to the cake. Trust me- this is one you want to make. It’s not just good, it’s go back for slice upon slice good. It’s pawn as much off on the neighbors so I don’t eat the whole cake good. You know. 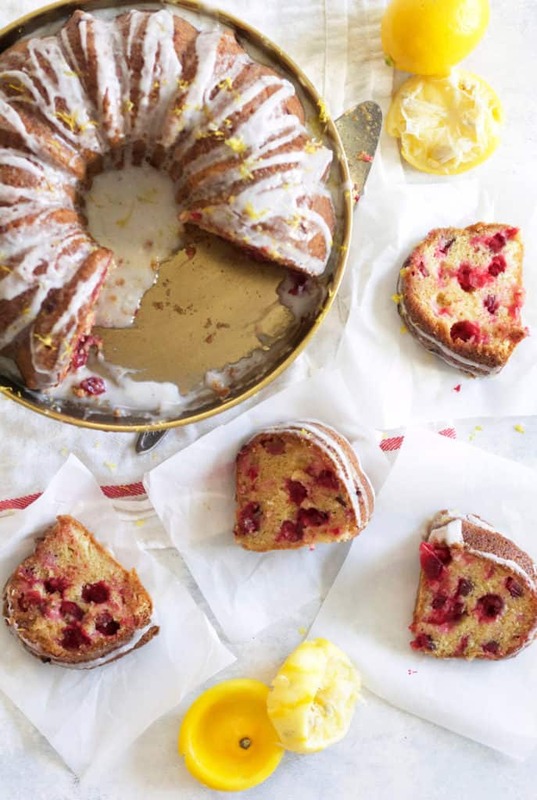 A simple, easy to throw together cake becomes truly out of this world due to soaking it with a meyer lemon syrup soon after baking. (Regular lemons work fine too!) 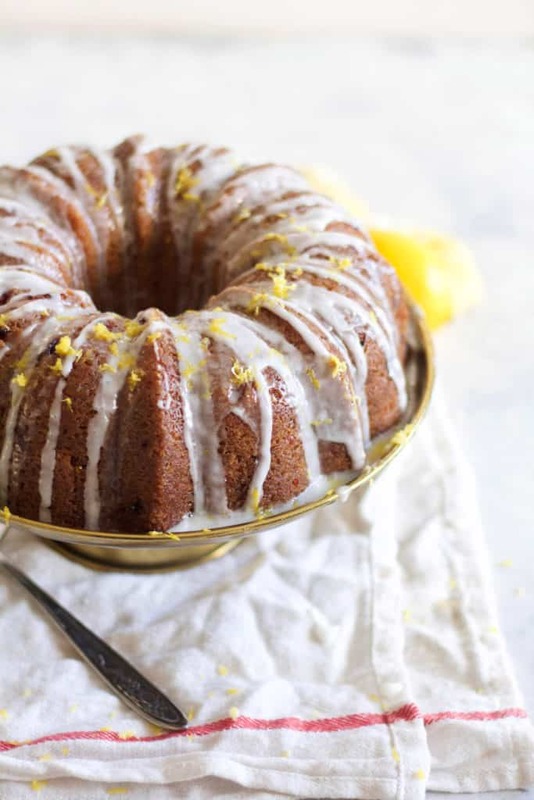 Generously slathering it with the syrup, letting it all soak into the cake, locks in the moisture for days and adds a hint of sweet lemon-y flavor in every bite. Added on top of that is a simple lemon glaze, that hardens a bit and crackles with you cut into the cake, creating a texture I just love. Crackly icing, and a super moist cake with tart, juicy berries is a win in my book. The cookie baking frenzy will no doubt begin soon, but I’m more of a cookies-all-day person than a cookies-served-for-dessert person. If I’m having a festive dinner party I want a beautiful cake or pie to serve to the whole group and for that this is perfect. And with Chicago weather dipping to the 20s this weekend, a bright sunny dessert like this is really just what I crave! Preheat oven to 350 F. Generously butter (or spray,) and flour a 9-inch bundt pan. Set aside. Whisk 2 cups of flour, baking powder, baking soda, and salt together in a medium-sized bowl and set aside. In the bowl of a stand mixer fitted with the whisk attachment, use your hands to rub the sugar and zest together for a minute or two. Add the eggs to the bowl with the sugar mixture and beat on medium speed for about 3 minutes, or until the mixture is thick and creamy. With the mixer running, stream in the oil, then add the sour cream and finally the vanilla. With the mixer on low speed, add the dry ingredients, beating just until combined. Toss the cranberries with 2 teaspoons of flour and then gently fold into the batter. Pour the batter into the prepared pan. Bake for about 45-60 minutes, or until a toothpick inserted into the center comes out clean. While the cake is baking, make the syrup: Combine the lemon juice and sugar in a small saucepan. Bring to a simmer, stirring to dissolve the sugar, then continue to simmer for 1 minute. When the cake has been cooled and inverted, prick the top with a fork all over and brush it generously with the syrup. Stir the powdered sugar and lemon juice together adding a tablespoon of the juice first, and then a bit more if needed until the glaze is a thick but pourable consistency. Drizzle glaze generously over the cake, and sprinkle with zest if desired. Allow cake to set before serving. * Regular lemon juice and zest can be subbed in this recipe no problem! I really suggest using the syrup. It makes the cake !! I happened to have everything for this cake on hand and whipped it right up. I absolutely loved it! A little sweet, a little sour – just the way I like it. This is going to be a holiday staple for years to come. is a 9 inch bundt pan the standard 12 cup bundt pan. oh so its not a real poke cake. wow that slice was actually wet when i made the poke cake a few months ago. also the cake was hot when you poured in the syrup. yours say to cool first that probably makes a difference too. cant wait to make it friday. i get the meyer lemons at trader joes. I feel like I always see cranberry and orange together but cranberry and lemon sounds so much better to me!! This cake looks wonderful! It’s hard to come by fresh cranberries where I live, how do you think dried will do? Chicago weather is dipping below the 20s. 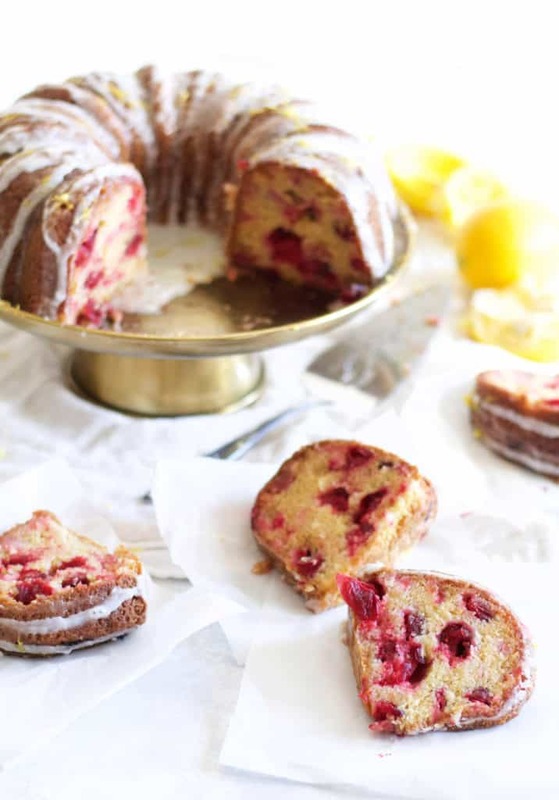 Craving this lemon cranberry cake…and so are our neighbors. Off to the kitchen! Hi there. Fresh cranberries aren’t common where I live, outside of Christmas season. Would frozen ones work? Or would you recommend fresh raspberries or blueberries instead? Thanks!